Swimming pool lighting is a great way to improve visibility in and around the pool as well as its appeal. Installing lights on your swimming pool ensures that you are able to use the pool both during the day and at night without any fears. In fact, lighting up your pool can also effectively scare away wild animals, which may find their way into the facility and cause harm to users. With proper swimming pool lighting, you are also able to create an ambient feel, making the facility more attractive and luxurious. As a result of this, you will also be able to enhance the general appeal of the home or establishment where the swimming pool is constructed. Since there are various kinds of swimming pool lighting to choose from, you must be keen to get the right match for your pool. Swimming pool LED rope and strip lights are among some of the best options that you can go for when thinking of lighting up your pool. Unlike most types of swimming pool lights, LED rope and strip lights offer greater advantages to give your swimming pool an outstanding appeal of luxury. Unlike most pool lights, LED rope and strip lights are quite bright and shiny, which make them a great option for ensuring better visibility. Owing to the powerful lights that they produce, LED rope and strip lights can offer so much flexibility on when you can use the swimming pool. Even in the darkest nights, these lights can still deliver greater visibility, making the pool to appear like its day time. As a result of this, there is always greater safety for users. In fact, the bright light can also effectively drive away wild animals from the surroundings of the swimming pool. Despite the brightness of LED strip and rope lighting, they also come with a dimmable function. When installed with the right controller, you are able to control the amount of light produced depending on your needs, prevailing weather and environmental conditions. This offers you the flexibility of regulating swimming pool lights to your personal preferences. Another benefit of using LED rope and strip lights is, they are available in a wide range of colors to choose from. Some of the most common LED rope and strip light colors include, blue, green, clear, red among others. However, it should be noted that you can also choose a LED rope or strip light that changes color in intervals. This would be a better and economical choice than buying lights with different colors. With a LED rope and strip light that can simultaneously change color, you can always set the color schemes to shift after some minutes, hours or even on a daily basis. With this, you will be able to generate a luxurious feel not only in the swimming pool but, also across the home or property where the facility in constructed. LED lights are generally long lasting with a lifespan of up to 60,000 hours. Compared to halogen lights, LED strip and rope pool lights can last up to ten times longer. As a result of this, you will not be faced with frequent replacement of swimming pool lights. Besides, the longer lifespan of LED pool lights will also reduce the costs of maintenance for the swimming pool, hence, very economical. Although LED strip and rope lights come in diverse voltage ratings to select from, they are very energy efficient. Despite the voltage rating of the swimming pool LED rope and strip lights installed on your pool, you will be able to experience reduced energy costs. This is because, the lights are enhanced with energy saving functions to ensure that they consume very little power. Therefore, installing LED lights on your swimming pool will also cut down the operational costs of the pool, which is also very cost-effective. 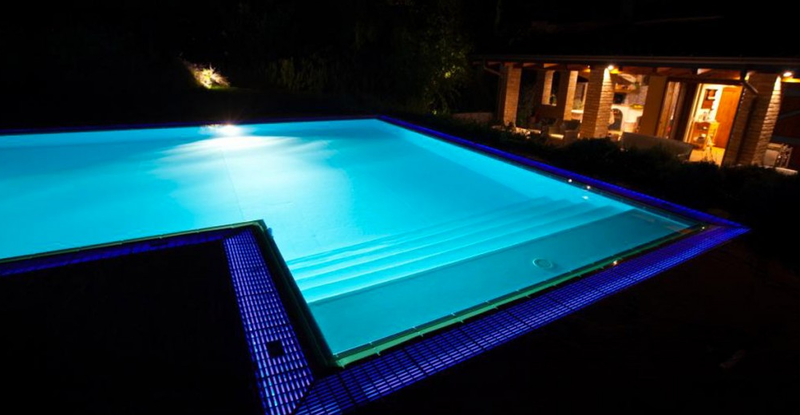 The stylish appeal of LED rope and strip lights is also another reason they have been able to gain significant popularity in most residential and commercial swimming pools. The lights can effectively create a decorative accent to make your home or business establishment more attractive and luxurious. Since the lights can also change their colors simultaneously, installing them on your pool can easily enhance the beauty of the property, creating a unique centerpiece therein. In fact, LED rope and strip lights can easily convince even those who are not willing to swim to take a dive due to their enticing appeal. Swimming pool LED rope and strip lighting is also very easy to set up along the perimeter of the pool. The lights are designed with easy-to-use features that you can simply install even by yourself with basic DIY skills. Besides, they usually come with instruction manuals for those who may wish to do the installations independently. However, it is always advisable that you contact a professional for pool lights installation services in case you are not sure of how to go about it. In order to get the best out of swimming pool LED rope and strip lights, you should always choose the most suitable ones for the pool that you have and, also install them right. Instead of going through a lot of hassles, simply come to Swimming Pool Singapore. We can assist you in choosing the best LED rope and strip lights for your swimming pool and budget. Besides, our experts can also deliver professional and customized swimming pool LED rope and strip lights installation services Singapore.